A great big thank you to all artists and MCs without your generosity we would not have been able to run this event. Thanks to all those who attended and we hope we see you again in at the next Moira Furnace Folk Festival. Thanks also for filling in all those feedback forms, they are a great help and all comments are being taken on board. Thanks to all committee members, all helpers, stewards... and a special mention of the late Dave Johns, the inspiration for the MFFF. Our first festival next to a canal! Beautiful setting, friendly vibe and up–for–it Friday night crowd! Moira Furnace Folk Festival was an absolute pleasure to be part of! Full marquee, fantastic audience, great sound and light, and the whole thing ran like clockwork! Congratulations to all concerned, hope we see you again. Moira Furnace Folk Festival is leaping from strength to strength, offering their audience an eclectic array of the best in folk music both locally and from further afield. A relaxed atmosphere, great music and beautiful setting, what’s not to like?! Our first visit to Moira Furnace Festival was a revelation – such a friendly, family, fun festival with great music, beer, food and company. What more do you want? We think Moira’s pretty much the perfect folk festival (although at times it feels more like an overgrown family reunion in a stunning heritage site). We’re hooked – as soon as one finishes we start looking forward to the next one. It certainly was another fantastic Moira, I think that they’ve got the recipe pretty much nailed for this lovely venue and great Festival. An absolute gem of a festival in an intimate setting with a warm and friendly gathering of folky folk! Such a friendly crowd at Moira Furnace Folk Festival. We always have a fantastic time, so thanks once again for a great festival. I loved Moira Furnace Folk Festival and am so grateful to have been invited. It’s a fantastic site and the atmosphere amongst artists, punters and festival organisers spoke volumes about what a friendly and relaxed approach there was throughout. Just a note to say thank you for having us. It was the best little festival that we have been to in a long time. Wonderful location, well organised, very friendly. ... And Jeremy (and co) did fantastic sound on the main stage. The line–up was excellent. Thank you again for a lovely weekend at Moira Furnace Festival. Such a beautiful setting. Grant and I had a wonderful time – the audiences for both concerts were so enthusiastic and responsive they really spurred us on. I haven’t enjoyed a festival so much in a long time! Thoroughly enjoyed playing at your wonderful festival again this year. The atmosphere is always a joy and loved playing to such brilliant joining in audiences. Thanks and well done to all concerned. Although our visit was brief it was lovely to get to such a compact friendly festival. Thank you to all the organisers / stewards / sound crews and food outlets! Hissyfit had fun! 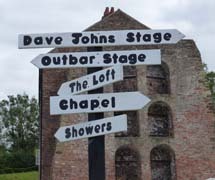 Back from a great couple of days at Moira Furnace Folk Festival. Great people, lovely weather and lots of good music. Isn’t it a shame when the weekend has to come to an end? Another fantastic Moira! I originally thought that the very First Moira was the Best, very reminiscent of Miskin, but this festival just gets better and better every year. Huge thanks to the Committee and all the Volunteers and Stewards, who worked so hard to make it such a wonderful weekend. This is a great festival to catch up with old friends and make new ones!! Another absolutely wonderful weekend!!! Don’t see how, but it just keeps getting better each year. I had a great time, thoroughly enjoyed it. It was good to see how much the Festival has progressed in a few years. You and your team should feel really proud. What a lovely Festival you have at Moira. Just special is what I think about Moira. In our opinion it is one of the loveliest, most gentle and relaxing festivals around. You and your team have done a splendid job and each year it has got better and better. You seem to have a huge team of stewards and they were excellent, very helpful and very smiley, so please thank them all, they did the Festival proud. I would like to thank you all very much for making our stay at the Festival one of the best days we have had this season. We are very lucky and have found ourselves at a lot of venues this season, but I have to say your Festival was truly superb. Ran by really nice folk and in a friendly manner, it was an honour for us to have been there. Moira truly is a magical weekend. It really is a special Festival. My first time at Moira and all I can say ‘It was brilliant’. What a fabulous weekend, a huge thank you to all the good people who have given us another successful and very special Festival with an excellent lineup! Thanks to everybody for the wonderful experience of our first Moira. Special thanks to the unfailingly cheerful and caring stewards, who were such a pleasant part of a first class Festival. A small but perfectly formed event. Has to be one of the best, if not THE best Festival out there. Certainly it is the one we book as soon as possible. Next years already looks like it is shaping up as another great weekend. What a wonderful Festival it is. Brilliant weekend again what a lovely Festival this is. We had a great time folks. Thanks to all you folks for a fantastic weekend. Thanks to the MFFF from myself and all the band. How good a weekend was that? This has been a cracking festival - something for everybody to enjoy, whatever your taste in "folk"
For a first festival, excellent - not even the "cold" Friday night that you get at some festivals - very good atmosphere for the whole weekend. Lovely atmosphere! Nice location - great potential! Loved the little night lights to mark the way "home"
Congratulations - what superb weekend. Well done! Extremely good festival, well organised. An excellent weekend. V v friendly and helpful "staff"
A great weekend, friendly people. A lovely interesting venue, I would definitely come again.